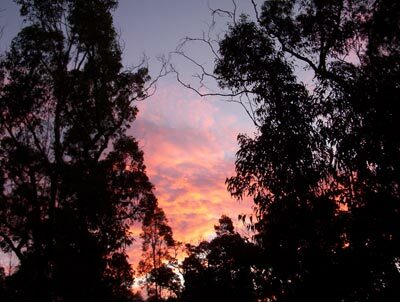 I live on the lower Blue Mountains of New South Wales, Australia. On most days recently, I have been walking to the end of my street. Here the fire track begins. 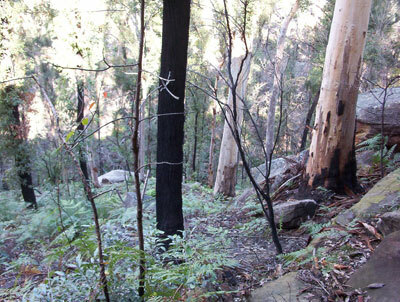 The rough, sandy track forms a pathway through the bush, giving fire trucks access in the event of summer bushfires. The track becomes a series of pathways, the further you wander into the bush. Over the The Bluff, the track to the bluff has become wider and sections have been seriously eroded. This damage has been caused by 4 wheel drives and motorbikes which come up the fire track from Emu Heights. You know you are on sandstone as parts of the track have now become very sandy. I usually keep to the main track. After about six minutes, the bluff is reached. This is the sandstone cliff top from which you look out over the valley to north Springwood. Below is Fitzgerald Creek, whose faint bubbling can just be heard. Looking westward up the valley, you see the junction of Fitzgerald Creek and Cripple Creek. It forms a fork in the bush landscape, as the valley walls slip down to the valley floor. Cripple Creek forms the left fork, having travelled down from the vicinity of the local tip to meet the Fitzgerald. Its journey takes it behind my home. I do not know why it is called Cripple Creek. But now the name is sadly apt, for the creek is very polluted. In the past few weeks my motives for walking to the bluff have been simply for exercise. I have started coming in the late afternoon. But on arrival, the bluff and its view become a welcoming distraction. The fact that I have been arriving around sunset has added significantly to this daily activity. I now come with a camera, to capture the ever-changing sunsets. Some days I watch the brilliant, golden glow of the sun, as it farewells the valley in a blinding flash of intense light. Like a giant spotlight, it highlights the place where I stand in a brilliance of light. The bluff responds in a radiance of colour and sharp, dazzling detail. The weathered, sandstone bluff openly flaunts its pitted, mossy surfaces, its crevices and crags, its folds and lichen stains. The tough, little native plants that bravely hang on between dirt-starved rocky crevices, pose proudly in the yellowy coating that washes over everything on the bluff. At the same time the valley below becomes muted as the sun’s rays, like theatre lights dimming, sink behind the western ridge. It is not surprising that the bluff reminds me of a stage. 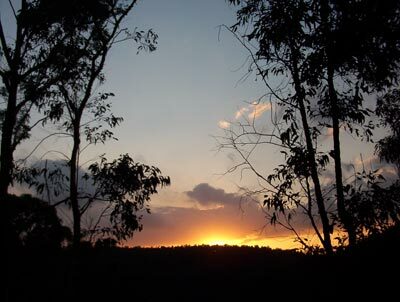 Just as the sun disappears, a gentle, cool breeze slips along the valley and up to the bluff. The faint bubble of the creek can just be heard as it slowly manoeuvres its way east to the river. The soft vespers of a lone bird echo somewhere in the valley. I sit on a rock shelf and feel the sun’s warmth still trapped beneath me. The golden smudge of the sun’s reflected rays sometimes moves slowly along the western ridge. It eventually highlights the trees in stark, night-black silhouette, as the fading, milky blue of the cool night sky savours the last warm light that gives it colour. The gold turns to flame red and streaky stains of pink and yellow, with smatterings of bubblegum blue. I am suddenly reminded of the flames on the ridge behind our home during the last bushfire. Although approaching in the early afternoon, the huge amounts of thick, black smoke that ballooned high above, covered the sun and cast dark shadows along the valley. When we saw the menacing, long, red gashes of flame on the next ridge top, we knew we were in serious trouble. The bushfires of 26 December 2001 (Boxing Day) dramatically changed the landscape of this area, of which the bluff forms a part. The fire ascended the ridge from across the valleys of both Cripple and Fitzgerald Creek. 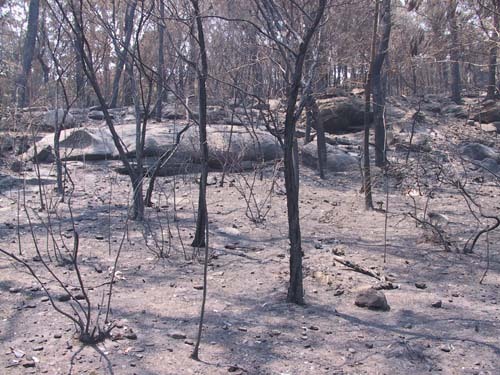 Almost all of the undergrowth was scorched, sandstone boulders exploded or split apart due to the fire’s intensity, and some trees were so severely burnt they no longer stand. Those trees that survived still bare the black fire scalds. Their new leaf growth appears irregularly in clusters on parts of their trunks and branches. Some of the thinner tree trunks have been bent out of shape by the heat and now stoop like old folk. The roughly amputated, blackened limbs of other trees lie sadly around their bases, tree roots often severely exposed. Two and a half years on and new native plants and trees have begun appearing across the bush floor and down the ridges. Despite the lack of good rains since the fire, they appear healthy. I have spent time photographing some of these hardy little plants. One plant I came across had even forced its way through a thin split in one of the fire-damaged rocks. The resilience of the bushland, after such trauma, continually amazes me. I have walked to the bluff many times during my years at Mt Riverview. It was a great place to bring my daughters, when we first moved into the area a quarter of a century ago. I love introducing this place to friends too. But most times I now come here alone. It is a place to explore and revel in the wonders of nature. It is also a place for reflection, a place for problem solving and a place to meditate. Above all it is a place to dream. The sheer wonder and beauty of the area inspires you to rise above life’s nagging uncertainties and futile worries, and to adjust your view to a higher plane. Sometimes the dream is a sobering recognition of, and gratitude for, what you already have. Jim Low is a singer/songwriter and published author. His background is in education and he has also developed learning materials for the NSW Department of School Education. His passion is Australian history.